The Kenton | Pub Quizzers | Find a pub quiz near you, now. 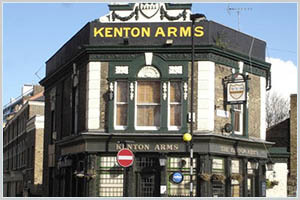 Pub quizzes take place at The Kenton, Hackney on Tuesdays (weekly) at 20:00. Entry is £2.00, you can have up to 6 people on a team. There are prizes of cash, drinks, food. Happy quizzing! The quiz with the big rollover jackpot! Every quiz is made up of six rounds loosely held together by one overarching theme. You can expect picture rounds, general knowledge, pop culture trivia, brainteasers, bizarre facts, musical intros as well as an opportunity to earn bonus points in one of our weekly 'challenges'. These vary depending on the theme, but past challenges have ranged from a blind taste test to a paper aeroplane flying contest. 3rd place win a scrumptious snack. 2nd a bottle of wine. 1st place win not only a £20 bar tab, but can either walk away with half the collected money or gamble on the "killer question", if your nominated team member answers this correctly you win the rollover jackpot!